My pie adventure continues! You may recall that earlier this year I resolved to bake at least one pie a month for the rest of the year, and likely beyond. So far, I'm still going strong. I haven't posted every single pie I've made this year, although I've definitely posted a few of the highlights along the way. One of my favorite summer fruit pies by far was this Blueberry Nectarine Pie. Meanwhile one that I fell in love with around the holidays last year (and may make again this year) was this luscious Peppermint Mousse Black Bottom Pie. There were so many other delicious pies, but these are a couple of the more memorable ones over the past 12 months. 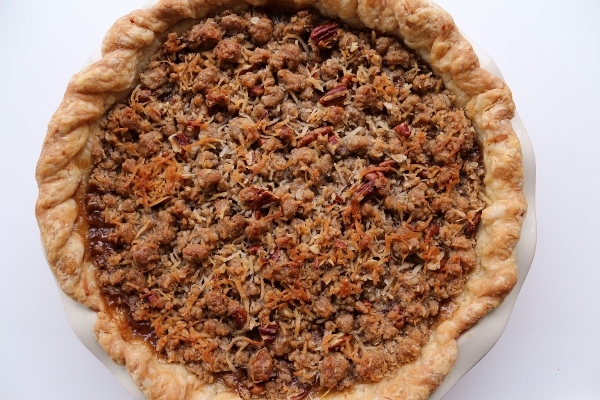 I recently made another pie that falls at the top of my love list. It sounds like a peculiar combination, but just trust me on this. 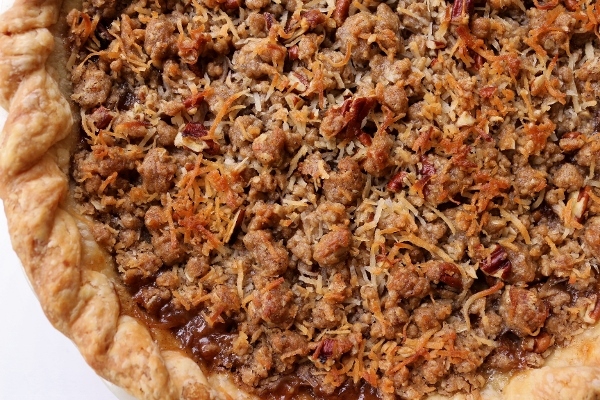 This Hummingbird Pie is based on a classic Southern cake by the same name. 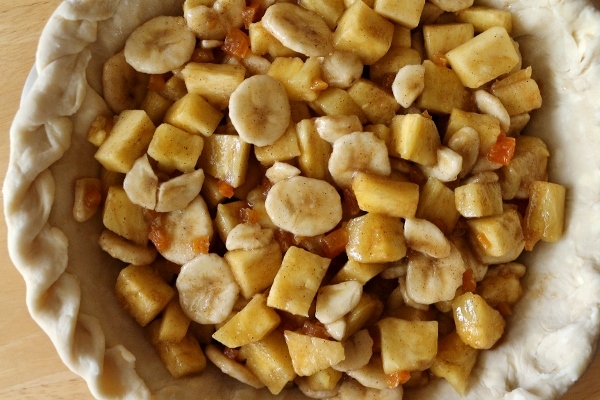 The filling is comprised of diced pineapple, sliced bananas, chopped dried apricots, brown sugar, rum, and spices. It honestly sounds more tropical than Southern from the get go. 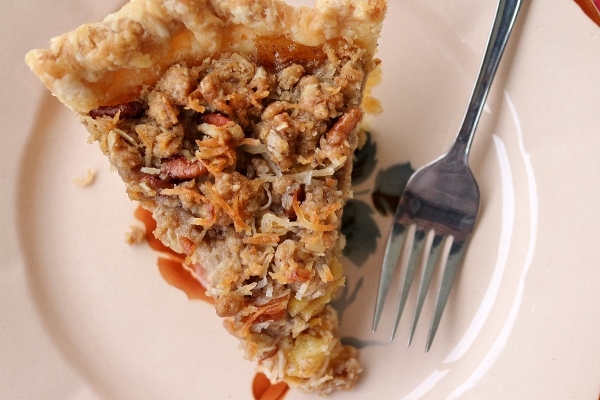 The filling is topped with a coconut pecan crumb, which continues the tropical theme with the coconut but adds just the right amount of Southern flair with a healthy dose of pecans. 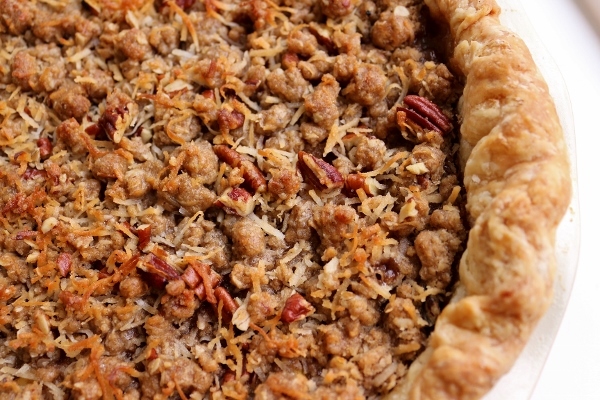 Since none of these pie ingredients are seasonal (the key ingredients grow in the tropics, not in my backyard), this is a great year-round pie recipe! Seriously, I can't stress enough how absolutely fantastic this pie is. I'm a fan of Hummingbird Cake and now I'm an even bigger fan of Hummingbird Pie. This is definitely a pie I will be making again. For the coconut pecan crumb: Use a food processor to grind the oats, pulsing the machine until the oats resemble coarse cornmeal. Whisk the ground oats, flour, sugar, cinnamon, ginger, nutmeg, and salt together in a medium bowl. Add the melted butter and mix with your fingers or a fork until small clumps form. 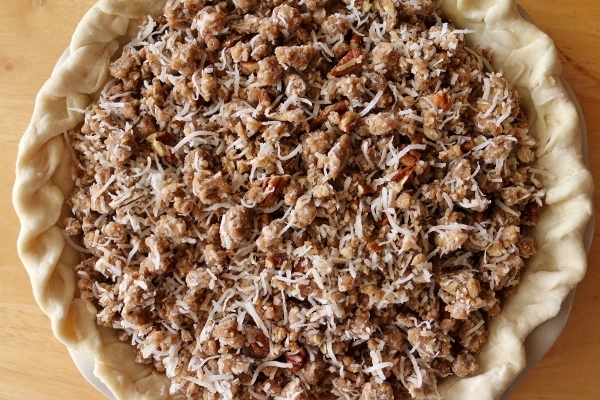 Add the pecans and coconut and mix lightly. 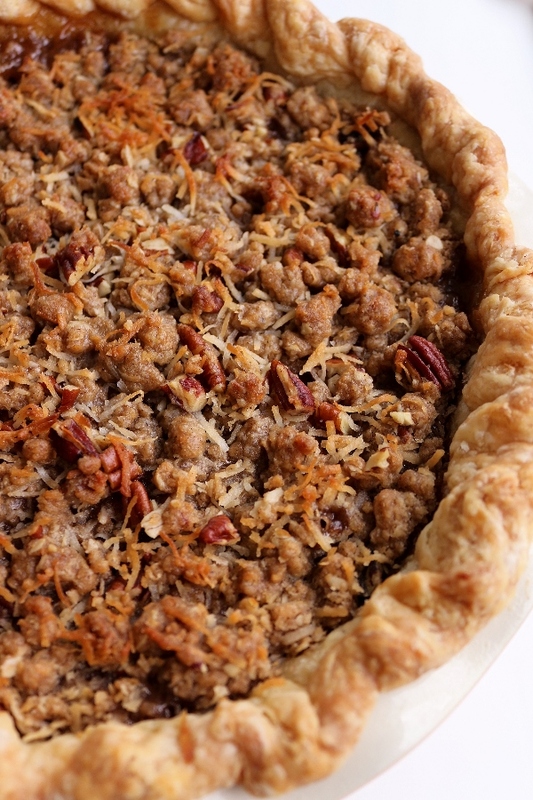 Chill the crumb for 15 minutes before topping the pie. Preheat the oven to 375 degrees F with a rack in the center. Line a rimmed baking sheet with parchment paper. Whisk the brown sugar, cornstarch, nutmeg, cinnamon, and salt together in a small bowl. In a large bowl, combine the pineapple, bananas, dried apricots, lemon juice, and rum, tossing lightly to mix. Sprinkle in the sugar mixture and toss well, coating the fruit and thoroughly moistening the cornstarch and sugar. 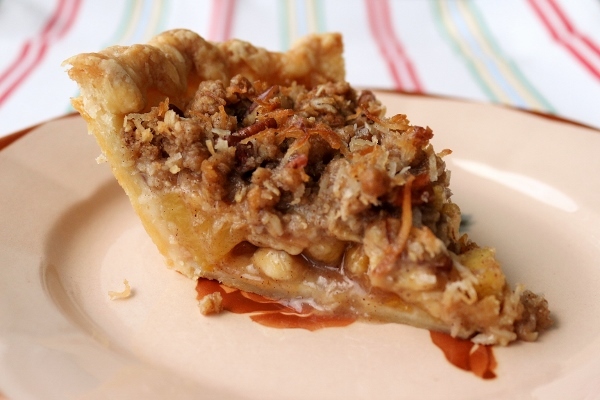 Retrieve the prepared pie shell from the refrigerator and set the pan on the parchment-lined baking sheet. 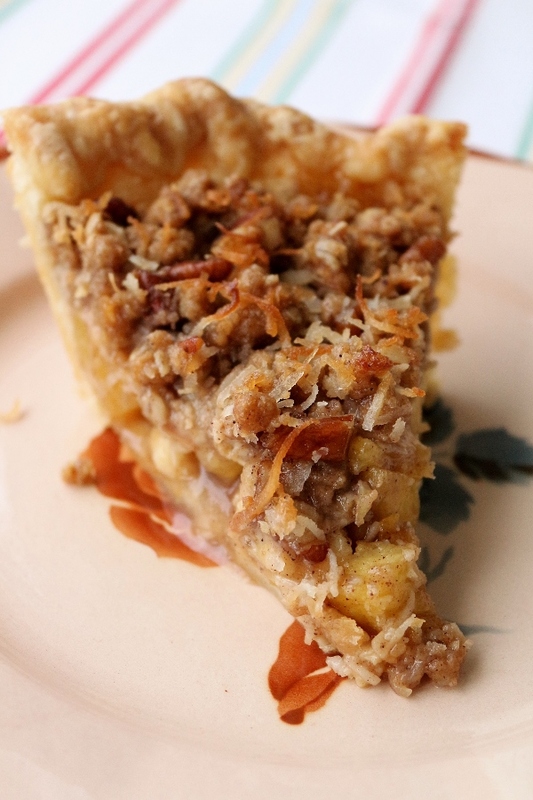 Scoop the filling into the pie shell and top with the crumb. Transfer the baking sheet to the oven and bake the pie 25 minutes, then rotate the baking sheet, lower the oven temperature to 350 degrees F, and bake another 25 to 30 minutes, or until the juices are bubbling (mine baked an additional 15 minutes beyond that). Tent the top with foil if the crumb starts to over-brown. Set the baking sheet on a wire rack and let the pie cool and set, uncovered, at room temperature overnight (or up to 3 days) (mine cooled about 6 hours, which was plenty of time for it to set while retaining its flaky crust), before slicing and serving with vanilla ice cream.